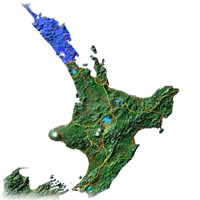 North of Auckland, you will find the Northland area (between the Tasman Sea and the Pacific Ocean). With its sub-tropical climate, this is a very pleasant place to be all year around - winter is very mild. Northland is famous for its beautiful long white beaches and native Kauri forests. Activities in the region include diving, hiking, golf, and a lot more. The region is also well known for its food and wine trails encompassing the country's northern most vineyards at Kaitaia. Other wineries offer coastal views and cafés which cleverly combine Mediterranean ambience with a distinctive New Zealand flavour. Rick Taylor's woodturning studio featuring his exclusive kauri bowls, pots, platters & more created from ancient kauri wood recovered from local farmland. Touch, smell and experience the fiddleback, mottled & whitebait grained kauri. Woodturning tuition, tools etc also available. Open every day till dark on State Highway 12. Food & internet adjacent. Mail order posting service. Kauri wood sales. Eco-themed Qualmark endorsed day tour of West Auckland where our family has lived since 1922. Small personal groups hosted by NZ-born operators. Includes lunch, Waitakere rainforest, craft-shopping, BeesOnline honey centre, wine-tasting, Muriwai beach and gannet colony. Visit our sheep farm and Homestead for afternoon tea. Unique Native tree planting for carbon offset. Exclusive tours available. A trip to NZ wouldn't be complete without diving the famous Rainbow Warrior - our most popular dive trip! Dive North is NZ's award winning dive operator - 2 yrs running offering great service and even better dive trips! Book now ready for your trip to NZ. Contact Sue or Dave, we'd be delighted to help with your trip plans so we dive the best of NZ! A full day tour from Paihia starts in Kauri trees in the Puketi Kauri Forest. Along the tour explanations of traditional uses of the Kauri trees and Maori culture are given by experienced guides. Ninety Mile Beach offers the enjoyment of the sand between the toes or to surf down giant sand dunes as desired. Finally the scenic bus journey visits the spectacular views from the northern most point of New Zealand in Cape Reinga. Adventure Puketi offer fully guided half day, full day and night forest walks. Experience the native flora and fauna of an ancient Kauri Forest, take a night walk and listen to the kiwi perhaps see one! Based in the Bay of Islands 30 mins from Paihia 15 mins from Kerikeri, pick ups available, campervan sites available and B & B option. Fly Fishing available on request. Off the beaten track. Charter our 22 m Brigantine ATAIR with crew for 2 days or longer and discover the beauty of the Bay of Islands and Northland's Coasts on a private and exclusive sailing trip. Have the catch of the day for dinner and enjoy the peace of a subtropical anchorage overnight. Sailing lessons, fishing and snorkel gear included. Experience the Bay of Islands Maritime Park on a 3 day / 2 night Sailing Expedition aboard the 72ft SV Manawanui. This is a down to earth coastal exploration with an emphasis on the marine environment and the outdoors. Sail, kayak, snorkel, walk and fish or just relax. Small groups: 12 passengers max. Departs Paihia Tuesdays and Fridays. Situated in the beautiful Bay of Islands with stunning views overlooking Paihia, Russell, Waitangi and Opua. An 18 hole golf course which is suited to all levels of play, whether you are looking for a challenge or a relaxed round, Waitangi Golf Club will cater for you. When you have finished your round, head in to the Club House for refreshments and reflection. Great hire equipment available. Absolute beachfront luxury holiday home on a sandy all tide swimming beach near historic Russell. 4 bedrooms and 2 bathrooms sleep up to 13 guests. Unobstructed beach and Bay views. All linen and towels supplied ready to enjoy. 3 kayaks and dinghy or swim to the diving pontoon in front. Fully equipped kitchen, laundry, free Internet and home theater with Sky TV TripAdvisor 5 star. A range of bus tours departing from either Auckland or Paihia provide a relaxing but rich experience in exploring the Bay of Islands in Northland. Attractions include the Hole in the Rock at Cape Brett, sandy beaches and bird life, the historic town of Russell, overnight boat cruise trip with snorkeling, kayaking and island walk. Additional tour options include and overnight cruise through sheltered waters and swimming with the dolphins. Learn to Surf with fully qualified surf coaches at Sandy Bay on the beautiful Tutukaka Coast. Small or large groups or individual lessons for all ages and skill levels. The Tutukaka Surf Beach Shop provides retail therapy for coastal holidays from surf boards and clothing to gifts, art and beach toys. Dire Straits Tribute Show, come along for a great night of entertainment with all the favorite songs - Romeo and Juliet, Money for Nothing, Tunnel Of Love, Sultans of Swing and many more, buffet and show $40. Come and take a class at Reireis school of Reggae. No musical experience necessary, Reirei will show you how its done. Sit back and listen to the master or pick up a musical instrument and join in. Every Thursday night from 8pm-late.